Author(s): Hesam Alizade, Research Center for Tropical and Infectious Diseases, Kerman University of Medical Sciences, Kerman, Iran. Fatemeh Fallah, Reza Ghanbarpour, Mohammad R. Aflatoonian, Arezou Taherpour, Hamid Sharifi, Hossein Goudarzi. Background: The purpose of the present study was the distribution of blaOXA-1, blaPER-1 and blaVEB genes and the genotyping of these genes in extended-spectrum β-lactamases (ESBL) producing uropathogenic and diarrheagenic Escherichia coli isolates. Methods: Of 432 isolates, 58 uropathogenic E. coli (UPEC) and 56 diarrheagenic E. coli (DEC) isolates were shown to produce the ESBLs. The isolates were screened to present ESBLs genes by PCR. 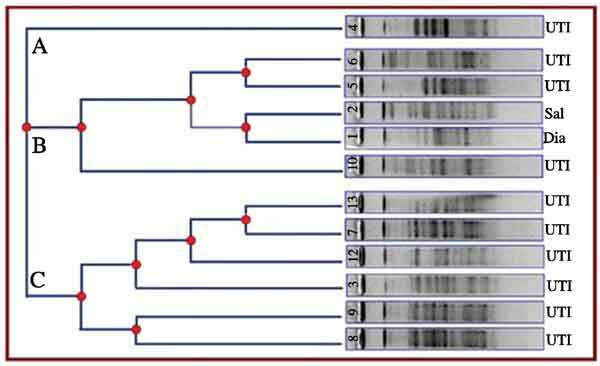 Pulsed-Field Gel Electrophoresis (PFGE) was used to genotype E. coli strains which possess ESBLs genes. Results: The blaOXA-1 gene was detected in 17.24% of UPEC isolates and 1.78% of DEC isolates. Of all the isolates studied, none were positive for the blaPER-1 and blaVEB genes. PFGE revealed that the E. coli isolates possessed blaOXA-1 gene comprised three distinct genotypes. Conclusions: The current study illustrated high rates of ESBL-resistant phenotypes of E. coli isolates from urine and diarrhea samples in Iran. The blaOXA-1, blaPER-1 and blaVEB genes were found at low frequencies in studied isolates. Keywords: Escherichia coli, extended-spectrum β-lactamases, genotyping, PFGE. Affiliation:Research Center for Tropical and Infectious Diseases, Kerman University of Medical Sciences, Kerman, Iran. Keywords:Escherichia coli, extended-spectrum β-lactamases, genotyping, PFGE. Abstract:Background: The purpose of the present study was the distribution of blaOXA-1, blaPER-1 and blaVEB genes and the genotyping of these genes in extended-spectrum β-lactamases (ESBL) producing uropathogenic and diarrheagenic Escherichia coli isolates. Methods: Of 432 isolates, 58 uropathogenic E. coli (UPEC) and 56 diarrheagenic E. coli (DEC) isolates were shown to produce the ESBLs. The isolates were screened to present ESBLs genes by PCR. Pulsed-Field Gel Electrophoresis (PFGE) was used to genotype E. coli strains which possess ESBLs genes. Results: The blaOXA-1 gene was detected in 17.24% of UPEC isolates and 1.78% of DEC isolates. Of all the isolates studied, none were positive for the blaPER-1 and blaVEB genes. PFGE revealed that the E. coli isolates possessed blaOXA-1 gene comprised three distinct genotypes. Conclusions: The current study illustrated high rates of ESBL-resistant phenotypes of E. coli isolates from urine and diarrhea samples in Iran. The blaOXA-1, blaPER-1 and blaVEB genes were found at low frequencies in studied isolates.